A nice sentiment. It’s the sort of thing those dreamy-eyed Christians say. But it’s not very practical. Consider this: God created the universe. Now does the idea that God is love sound a little more practical? In case it still seems dreamy-eyed, let’s tease it out with a little thought experiment. Put yourself in the shoes of God (but don’t let it go to your head!) There’s no universe. The big bang hasn’t happened yet. It’s just you all alone with your infinite, eternal thoughts. What happens next? What sort of universe do you create? It all depends on what you think of as fun, doesn’t it? What, O God, gives you pleasure and joy? Let’s say you just happen to be in a bad mood that day. You stubbed your toe on . . . something . . . and it got your goat. In fact, you’re downright angry! So you open your divine mouth and say, “Let there be pain!” And there is pain. Out of your fingers spins a universe full of nothing but pain and anguish for all creatures, throughout all time and eternity. You suffered pain, and you’re going to make everyone else suffer pain, too. It could have happened that way, you know—if God just happened to be a God of pain and anger. You see, who God is and what God is like determines what the whole universe is like. As we look out at the universe, then, and at our place and experience in it, nothing is more practical than knowing what the God who created it is like. Everything depends on it. 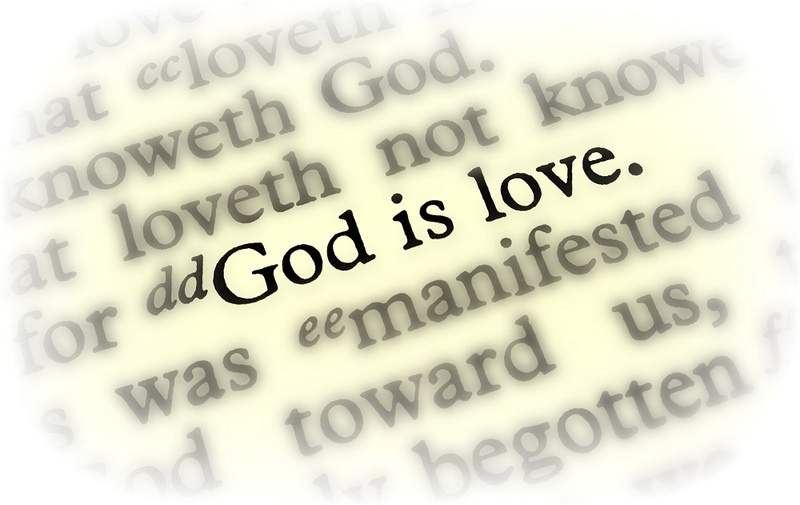 Those dreamy-eyed Christians—at least, the ones who pay attention to 1 John 4:8, 16, say that God is love. If that is true, it makes all the difference in the world. What if it is true? What if God really is love? What does that mean for the universe? What does that mean for us? For our lives? The essence of love is loving others who are outside oneself, wanting to be one with them, and blessing them from oneself. He then goes on to encapsulate what this means for the universe and everything in it, including us. It’s a beautiful passage, if a bit philosophical. You can read it for yourself here. Current scientific doctrine assumes that there is no purpose or intentional design in the universe. Instead, the universe simply evolved blindly according to the laws of physics, and later the laws of biology, according to the varying environments and conditions as they arose spontaneously in the developing universe. But what if there is a purpose and a design for the universe? And what if that purpose and design is the expression of a God who is love? Doesn’t that fundamentally change the nature of the universe? What if every law of the universe, and everything that occurs in nature as we observe it, is actually meant to accomplish something? From a Biblical and Christian perspective, the created universe definitely is designed to accomplish the goals in the mind and heart of the God who created it. And if we consider the Creation story in Genesis 1 from a spiritual and philosophical perspective, and notice that the culminating creation is humankind, then we can understand that we humans are a key part of God’s purpose and plan in creating the universe. This doesn’t have to be an exclusive thing, as it has sometimes been interpreted by Christians. God loves all of creation, animal, plant, and mineral, both for its own intrinsic beauty and for the way it contributes to God’s overall goals in creation. Let’s get to the point. From a spiritual perspective, God’s purpose in creating the universe is to have beings to love and make happy. That’s because, as Swedenborg says, “the essence of love is loving others who are outside oneself, wanting to be one with them, and blessing them from oneself.” In creating the universe, God wanted to create beings who were distinct from God, God wanted to be connected and united with those beings, and God wanted to bless those beings—which means giving them happiness and joy. God therefore created everything in the universe with an ability to express itself and find some sort of happiness and joy on its own level. The higher the created being, the higher that happiness and joy can go. Consider molten rock cooling deep beneath the surface of the earth, forming beautiful crystals and pockets of precious metal. There is a certain expression of joy in that, even if it is not consciously felt. Consider a seed germinating in the ground, sprouting toward the warmth of the surface, reaching its branches and leaves toward the sun, and bearing its flowers and fruits. Isn’t there a sense of joy in that? Consider an animal freely roaming in its habitat, finding and eating the food it finds delicious, mating, forming bonds with others of its kind, and caring for its young. Isn’t there pleasure and joy in that? Not just among humans, but throughout the created universe, there is a sense of joy and fulfillment in each and every rock, mineral, plant, tree, insect, reptile, and mammal as it expresses its nature and goes through its life cycle. All of this is an expression of a God who is love, and who loves everything in the created universe. We humans are simply the beings who have the most capacity to perceive and participate in the love of God that fills the universe. And isn’t that what we are here to do? There is a confusing welter of doctrine and dogma among the various Christian churches and sects on what the Bible is all about. Let’s consider for a moment the idea that every single book, every single chapter, every single verse, every single word, every single syllable of the Bible is an expression of the love that is God. What if the Bible is nothing but an expression of God’s love for us? It certainly doesn’t look like it at first glance. The Bible is full of wars and murders, treachery and betrayal, conquest and oppression, wrath and anger. How could all of that possibly be an expression of divine love? When the Bible says that God is angry and wrathful, what it really means is that God’s love burns so strong that it is ready, willing, and able to destroy all of the obstacles of selfishness and greed that we humans have created and placed as a barrier between us and God’s love. Yes, even the harsh parts of the Bible are all about God’s love seeking a way through our thick skulls; seeking a way to soften our stony heart, and replace it with a heart of flesh that pulsates with love in return. However, God will never force us to accept God’s love. God not only loves us, but respects us enough to let us make up our own mind whether to accept and return God’s love. Yes, God loves us whether we are good or evil. The entire Bible is designed to reach us, to get it through our thick skulls, that God loves us, and wants us to be happy to eternity. It’s all well and good for those who have placed themselves in stubborn opposition to God, and to God’s laws, to think that God is angry with them and plans to punish them. As I just said, sometimes God must show us a stern face to snap us out of our foolishness and stupidity, and scare us into straightening out or lives. But Christianity—true Christianity—looks past the masks of sternness and anger to see the true, loving nature of God. And Christians—real Christians—are no longer opposed to the love of God, but willingly seek out and follow God’s will and God’s love. Shouldn’t Christian doctrine also look past the appearance of a stern, angry, and wrathful God, and found itself on the infinite love and wisdom of God instead? I’ll put it plainly. Any so-called “Christian” doctrine stating that God is wrathful and angry with us, and plans to send us to hell, is a false doctrine. It is based on how God looks to us when we are opposed to God, and not on how God really is. This means that everything God does is done from love, not from wrath, anger, and an intention to send us to hell if we don’t follow God’s instructions precisely. On the contrary, God is continually seeking out the slightest chink in our armor of opposition and rejection so that God can come in to us, and eat with us, and give us all the happiness and joy that we are willing and able to receive. The sole aim of the Lord God Jesus Christ and of all Christian doctrine is to reach out to us in our stubbornness and opposition, and bring us to a point of repentance—of radical change in our heart and mind—so that we will accept the love, light, and joy that God so deeply longs to give us. Hundreds of millions—perhaps even billions—of people wander this earth thinking that they are lost. They think that no one, not even God, could love them. Even many whose religion teaches them that God loves them often have a sneaking suspicion, or an outright conviction, that they are the one exception. “God couldn’t possibly love me,” they think to themselves. No matter who you are, and no matter what you have done, God loves you. No matter how much you have resisted God’s will and broken God’s laws, God still loves you. There is nothing you can do to cause God to stop loving you. That’s because God is love. God is not capable of doing anything else but loving you. And even if God were capable of it, God does not want to do anything but love you. When God looks at you, God sees the beautiful angel that you can be—the beautiful angel that is already inside you. The purpose of our life here on earth is to become that angel. When we realize that God loves each of us in a unique and specific way, and created each of us for a unique and specific purpose on this earth and in heaven, doesn’t that change how we view ourselves and the meaning of our life on earth? God sees in you a particular life, character, and ability to love and serve your fellow human beings in a way that no one else can. Everything you have done and experienced in your life is—or at least can be—a part of God’s plan for your eternal joy. God is love. God loves you. And that makes all the difference in the world. Yes, there is much pleasure in that. That is what I wish was the case for all animals.